Marjorie Treadwell is fighting the odds. 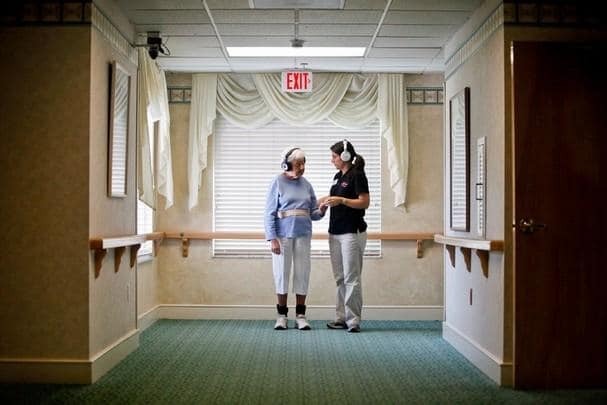 The Pelican Bay resident knows elders are prone to falls, which can often snowball into serious health problems. The 90-year-old doesn’t intend that to be her destiny. 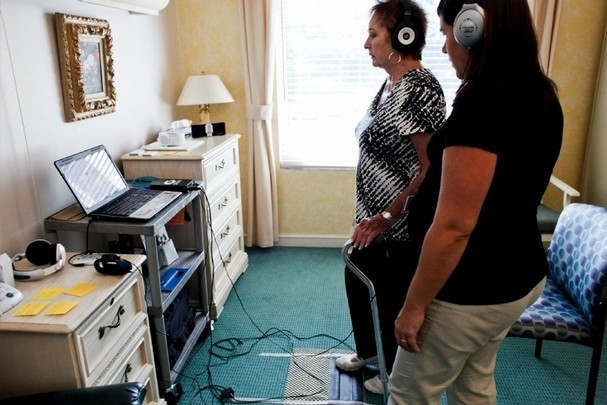 A few weeks ago, Treadwell began a brain rehabilitation program that uses a computer-based interactive metronome to improve her gait — and confidence — to stave off falls. 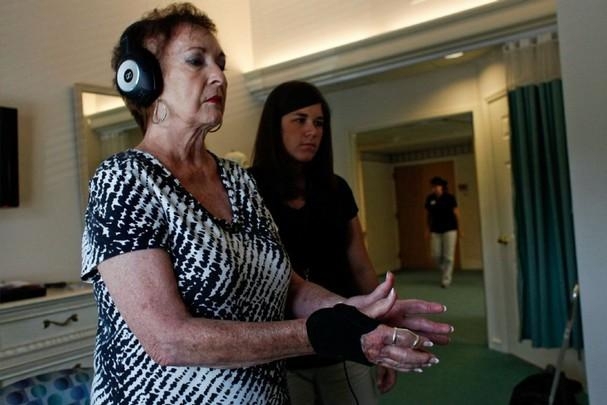 “This is the gym for the brain,” said Amy Owler, assistant director of rehabilitation at the Glenview at Pelican Bay. An independent living community, the Glenview last year bought an interactive metronome, a computer-based rhythm program, to use with patients in its nursing and rehabilitation center. The goal is to improve patients’ motor skills, their ability to focus and filter out distractions and improve physical stamina after a fall or stroke. Recent studies show the program may also help people with Parkinson’s disease. Developed 20 years ago to help children with learning disabilities and attention problems, the interactive metronome is increasingly being used with older adults to improve brain neuroplasticity, the brain’s ability to change and learn, said Kelly Coleman, an occupational therapist at Premier Place, the 35-bed bed rehabilitation center on the ground floor of Glenview. The program involves cowbell rings set to a rhythm that a patient listens to in headphones. Exercises are designed around clapping or taking steps in sync with each bell ring. The key is repetition. To improve a patient’s gait, sensors are placed in the patient’s shoes and he or she tries to take steps or tap a sensor pad at the same time as each ring The repetition leads the brain to adapt to improve motor planning and sequencing. Treadwell signed up strictly as a prevention measure against falls, but the therapists found she occasionally crossed one foot in front of the other while walking. “We have her do different exercises to challenge her timing and rhythm,” Coleman said. After a few weeks, she already feels more confident her walking has improved. Her tendency of crossing one foot over the other has been replaced with a focused stride. The program may have even boosted her golf game. Bette Massie, who is “over 50,” was forced to use a cane after a fall in February. She started out wanting to improve her cognitive ability, but the interactive metronome also has helped her balance. In one exercise, she moves her hands in a small circle and claps with each cow bell ring. She started the program sitting down but now stands. Another exercise involves taping a foot sensor, alternating her feet, to each ring. It’s hard to visualize how the interactive metronome will help, Massie said, but she has seen a difference in a few weeks. “My endurance was very poor and now I can stand a long time,” the Naples resident said. Since Glenview spent $6,000 for the program last year, 10 to 15 patients have gone through programs of three sessions a week for four to six weeks. So far, most of the clients have not been patients of the rehabilitation center but are “outpatient” clients who live in Glenview or have been referred from doctors. The center will accept patients from the community. Medicare will cover the expense with a physician referral, Owler said. The aim with stroke patients is to get the side of the body that has been impacted by the disease to be more in tune with the side of the body that has not been effected. While it may seem like people with Alzheimer’s disease should benefit, that is not the case because of the progressive nature of the disease, she said. With Parkinson’s disease, though, patients have the mental capacity to absorb and make changes to their brain functionality. 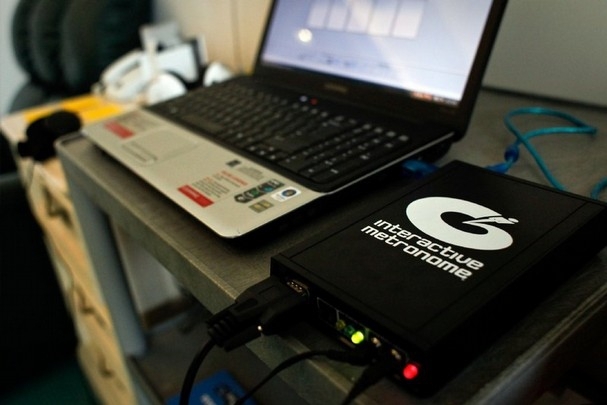 How long someone with Parkinson’s disease needs to use an interactive metronome depends on the severity of the disease, Coleman, the occupational therapist, said. Studies show varied results with Parkinson’s patients. A 2010 study that involved a randomized study with 42 participants did not show dramatic improvements in mobility and daily living functionality, but the British authors added the caveat that the program may very well improve patients’ quality of life, given extensive training. Another study done in California, and underwritten by the Florida-based Interactive Metronome, involved 36 patients, with one group getting training and the other being a control group. The results found both groups made improvements but not significantly, according Dr. Daniel Togasaki, the study author, at The Parkinson’s Institute in Sunnyvale, Calif.
“These results suggest that computer-based motor training regimens might be useful for improving or retaining motor functions in Parkinson’s disease.” he wrote. In due time, the therapists at Glenview’s center plan to network with local Parkinson’s disease support groups and geriatricians to promote the program. So far, patients have been happy with their results, Coleman said. “To hear that it is improving the quality of life, that is the ultimate goal,” she said.